Chembur East is a prime residential area in East Mumbai. Surrounded by Deonar, Kurla, Govandi, and Ghatkopar, residents of Chembur East can easily access the IT hubs of Vikhroli, Airoli and MAHAPE. A dynamic locality, Chembur East got its name from its native Agari community, and is home to parks, playgrounds, and gymkhana clubs. All basic amenities are available in the vicinity. Chembur East is ideally located – the area has many upscale residential complexes like MM Spectra, Ruparel Orion and others, with many more coming up. SV Patel Nagar, Gurudwara, Aggarwal Colony and New RNA Colony are some of the localities here. With its excellent network of roads, and a conveniently located local train station, connectivity from Chembur East to other parts of the city is a breeze! With several entertainment options, medical facilities, schools, colleges and shopping centres nearby, Chembur East is the preferred neighbourhood for families. Chembur East is located close to several corporate hubs like MAHAPE and Airoli, as well as to BARC. Many retail outlets are also present here, offering ample employment opportunities. The local market offers everything from clothes to foods and vegetables - all the daily-needs of residents are taken care of right here. Various malls like Cubic, Inorbit and K Star meet all other shopping needs. Chembur offers a variety of food as well as entertainment options – the area is well known for its street food, high-end restaurants and multiplexes like PVR and Cinemax. Excellent medical facilities like Hiranandani Hospital, Fortis Hospital, and others are easily accessible. Chembur is known for its parks, jogging tracks, golf courses, and open green spaces. You can also visit various places of worship nearby. Avoid peak office and rush hours. Moving your household goods in the early morning or late night would be ideal. You want the move to be smooth, with no chaos for your neighbours as well. That requires careful planning and execution – that’s where the need for an efficient and professional packing and moving company comes in. We incorporate innovative use of technology to ensure immaculate service quality to our customers, delivered through a well trained professional move team. From the booking to post move services, enjoy the most amazing move experience ever with us. What truly makes our service stand apart is the innovative use of technology which gives wings to our vision. Experience seamless and hassle-free packing and moving solution which is made possible by the world’s first ever true instant relocation charge auto-quoting engine. This technological marvel calculates your move quote once you enter your move details. The system generated quote makes the pricing completely transparent. The additional option of customizing the quote online truly defines that customer is indeed, the king. Pikkol is the only platform where the customer is encouraged to benefit from the dynamic pricing nature of packers and movers industry. Gone are the days of constant calls to the packer and mover for updates. Our new age technology centric relocation services and solution allows our customers to track each process online through our real time updates thus making each move an outstanding experience by itself. We are, simply put, a group of individuals sharing a common vision of ushering in a new wave of change in the way the Indian relocation industry operates by bringing in the much needed standardization of various parameters including safety, accountability, professionalism and unmatched service experience at affordable rates for packers and movers. Pikkol, conceived as the brainchild of a group of enterprising young men in April 2015, operates as a move manager service platform where customers can search for a tailor-made solution for their relocation needs. 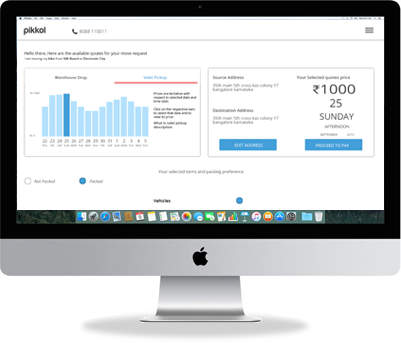 Founded and managed by IIM Alumni, Pikkol’s mission is to make every move happening in India a hassle-free delightful moving experience for our customers. Unlike a marketplace where your requirement is passed over to any vendor, Pikkol truly cares about your move and deploys specially trained teams for the service execution. Our teams are trained on best practices followed in packing, unpacking, handling, transportation, safety, etiquette and operating technology. May it be house shifting or vehicle shifting, the teams are well equipped and trained to safely handle your belongings during loading, unloading and transportation. Professional Packers and Movers are must-haves when you are changing residence. In a place like Chembur East, Mumbai, moving and transporting a huge number of goods within the city can be stressful and challenging. Pikkol Packers and Movers are experts with vast experience in both local and inter-city moving. Our motto: make shifting and relocation easy, hassle-free and affordable! Pikkol Packers and Movers ensure that changing residence is a smooth and pleasurable experience for our customers. Our services are unique - we have integrated technology to make the entire process of packing and moving easy and stress-free. We are constantly in touch with our customers - from getting an accurate online quotation, to fixing the pick-up date, dispatching details, and tracking the movement of your belongings at the click of a button. Our move supervisors use GPS-enabled devices to provide you real time updates of the shipment. So leave all your packing and moving worries to us and enjoy the experience of moving peacefully to a new place. Happy moving!
" Very well managed, Highly Efficient and least troublesome. Every Article was packed and shifted with utmost care and nothing has been missed out. Had an amazing experience. " " Changed my perception about shifting stuff....From one place to another. Hassle free, clean and friendly service. Nice to see a firm trying to create delivery standards in this unregulated and scattered market. Kudos ! Keep up the good work." " Amazing moving experience. Used their services for local shifting. They know their work very well and all my stuff was moved undamaged and hassle free. Best is they help with dismantle and again arranging the stuff back, once moved. " " It's been good service from pikkol. Very friendly team. Understands the customer requirements. Very prompt, helped me in having a smooth shifting. " " Pikkol has no doubt been our best packing and moving experience so far. Pikkol has a very good blend of packaging quality and customer service. The team was very professional and we didnt have to worry about anything as they managed the entire work very efficiently. The entire experience was very pleasant and we keep recommending the same to friends looking out to relocate." Safe packing is the key to ensure a safe, damage-free move for your TV. See how our professionals make your TV ready for a safe intercity travel. Then the first thing you want to do once moving into your new home will be to sit and feel that familiar comfort of your favourite corner on your sofa. See how we make that happen. Pikkol ensures that handling and packing are impeccable by assigning only the most trained professional for your move. Following best practices in packing make sure your refrigerator reaches you damage-free. Your valuable crockery collections are always close to your heart and are priceless to you. See how our teams packs them, so that your collections are well handled and your memories and sentiments associated with them are moved safely. Every motorcycle owner demands the best of care for their bike when it need to be moved, specially to a new city. We understand this and make sure that all the special care required to transport a motorcycle without any damage is followed. We ensures that your chairs are packed using the best of the materials and packing practices for a damage free delivery at your new home. Clothes need to be packed properly to shield them against damaging agents such as moisture, mildew etc. Our packing methods provides your clothes with the safety and protection they need. Our packing teams ensure that your Cot is handled in the best possible manner so that they are assembled and ready for a good post move siesta at your new home. Pikkol ensures that handling and packing are by assigning only to the most trained professional for your move. Following best practices in packing make sure your refrigerator reaches you damage-free. You may not want to miss the late-night game of your favourite club on the day of move. Our packing teams ensure your Television is packed such that it is safe and ready at your new home.